Decoding Through Analogy is the process of learning to pronounce new words by using known or familiar words. Research shows that struggling readers learn phonics by recognizing word patterns used in similar and known words, not by memorizing rules (Caldwell & Jennings & Lerner, 2014, p.184). 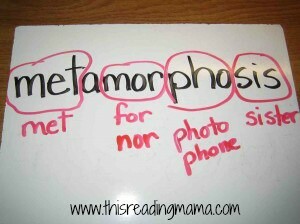 This strategy is especially useful in the upper elementary grades where students often encounter multisyllabic words. It is suggested to use an integrated approach when teaching students to use this strategy. Teachers should be sure to include understanding rhyme, learning to use key words, spelling patterns, and learning to cross check to see if the word makes sense along with decoding through analogy. Choose words that have frequently used spelling patterns that are extracted from a piece of literature the students are working with currently in the classroom. As with most reading strategies, the teacher should explicitly and frequently model how the strategy is used effectively and offer students many opportunities to learn and apply the strategy in meaningful situations. The teacher will begin by pulling out an unfamiliar, multi syllabic word from a text selection. The teacher can then write the word on the Smart board or whiteboard. As the teacher attempts to break apart the word into familiar chunks, he/she thinks aloud as she breaks apart the word and thinks about other known words to help read the word parts. Using those familiar word parts can help pronounce the word altogether and use the meaning of those familiar word parts to guess the meaning of the word. There is one instructional program in particular interest to teachers that teaches word analysis through analogy. This program is called Benchmark Word Identification/Vocabulary Development Program. This program stresses the use of context clues and decoding by analogy. This program is very detailed and comes with daily scripted lessons. The Benchmark program teaches decoding by analogy through the use of key spelling patterns (Caldwell & Jennings & Lerner, 2014, p. 184).